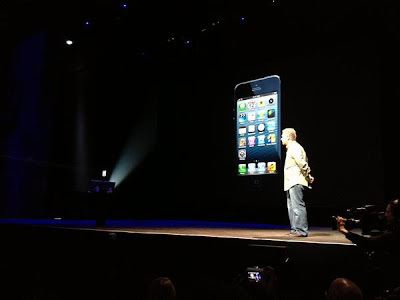 Apple Inc.(NASDAQ:AAPL)'s Schiller shows off first iPhone 5. The device pretty much matches the images leaked online over the last few months. He calls it “the most beautiful product we have ever made,” noting that the body of the device is “made entirely of glass and aluminum.” He says it is 18% thinner and 20% lighter than iPhone 4S. And, yes, the iPhone now has a 4-inch screen, bringing it to par with many of the Android devices on the market. Apple has designed a new chip for the iPhone 5, called the Apple A6. Schiller says it's two times faster in the CPU and graphics capabilities. It's also 22% smaller than its predecessor. Schiller says that applications will work as before, even though most iOS apps have been designed for the 3.5-inch screen. But Apple seems to have given a handful of developers an early peek at the specs. He's now showing off a new CNN app that's designed for the larger display. He adds: "This truly is the world's most advanced display." Shares of AAPL are flat at $660. · Glass and aluminum design. · "The world's thinnest smartphone"
· Older third-party apps will have black bars on the sides until they're updated. · Some third-party apps like CNN have already made their apps fit the new screen. · Screen is better, 44% more saturation. · Touch sensors integrated into the screen, more accurate touch response. · Will connect to the fastest wireless networks, including LTE. · Single chip for voice and data connections. · Wi-Fi chip runs at 5 GHz, allowing you to download data up to 150 Mbps. · New A6 processor, twice as fast as the chip in the iPhone 4S.